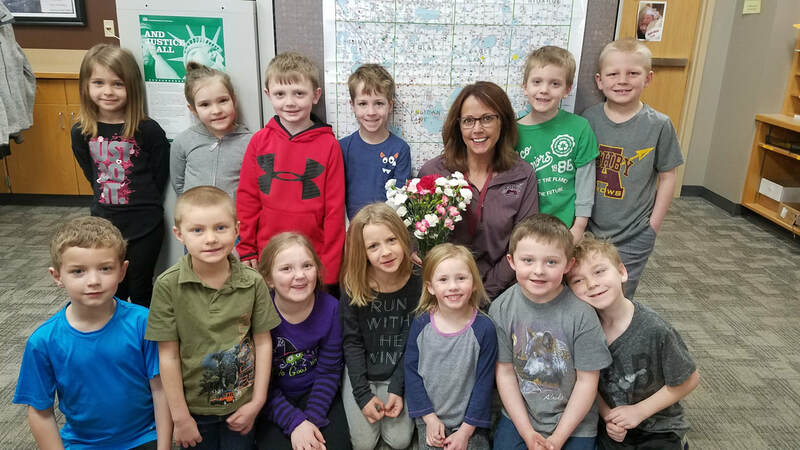 Mrs. Welch's kindergarten class say goodbye and wish Miss Andrea well as she leaves us for another opportunity! Sledding is especially fun in fresh snow! Wait, what, that looks like a pretty big elementary kid... nope, it is Principal Moore taking a turn on the hill! 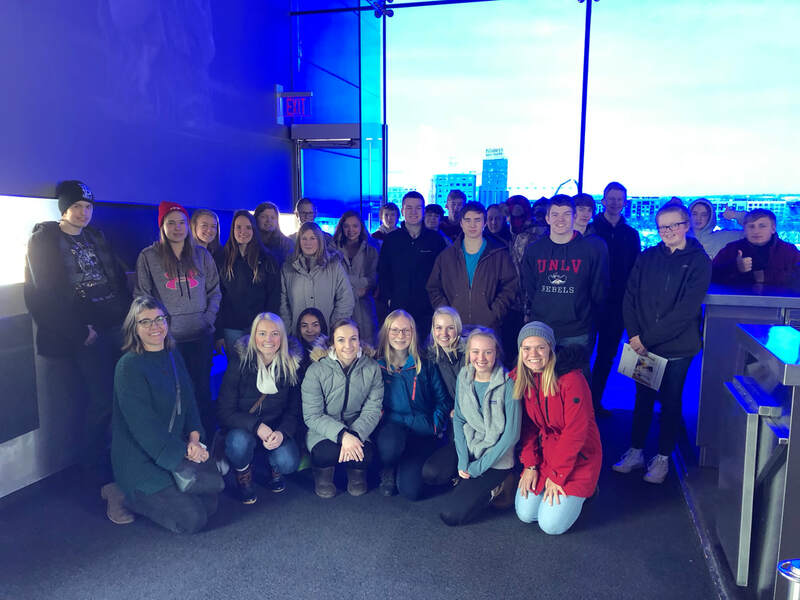 Trip to the Guthrie Theater to watch As You Like It. The Cat in a Hat was at APS celebrating I Love to Read month with students! What fluid power is...with teamwork! Ashby students working as a team on the fluid power team challenge at ATCC. Ashby 8th grade team wins!!! 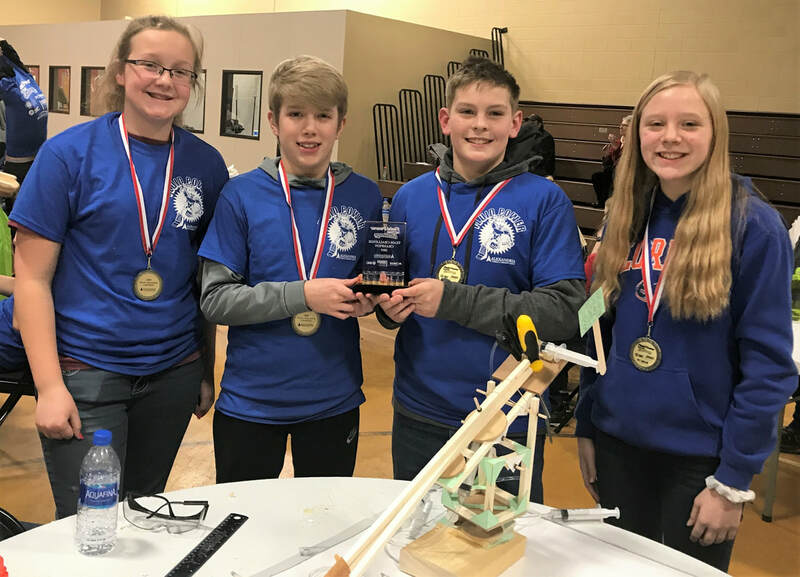 ​These Ashby Arrow 8th graders attended and won the Team Challenge Fluid Power award held at Alexandria Community and Technical College on February 27. The competition is meant to give students the chance to think and work like engineers. The goal was for students to design and build a device able to move a block of wood to designated areas using only fluid power. 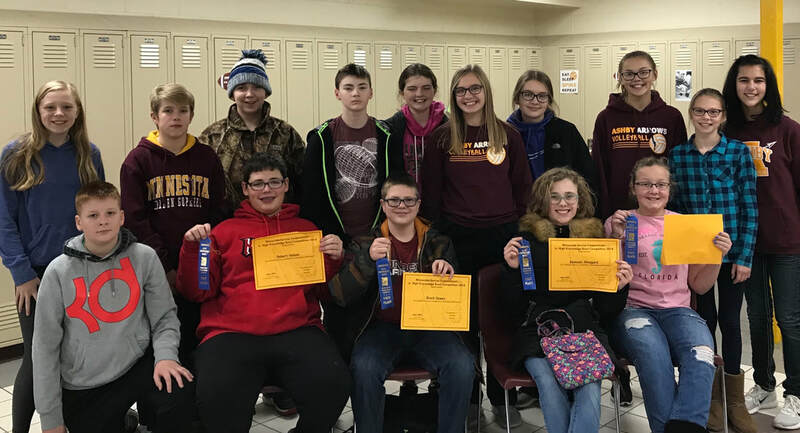 There were 17 other teams from the area including Alexandria, Fergus Falls, and Minnewaska. The Ashby Arrows represented well and scored the most points earning them the trophy and medals for the top Team Challenge Champion Award! Pictured below are (l to r): Livy Johnson, Brodie Ecker, Ethan Johnsrud, and Emma Erickson. Grades 4th - 12th enjoy a day of snowboarding and downhill skiing at Andes Tower Hill. Congratulations to the Junior High Knowledge Bowl team for taking 1st at heir last meet!! Players and spectators enjoyed an evening of family entertainment at the Donkey Basketball game on Monday night. New rodeo stars will be born during the wild and crazy "DAIRYLAND DONKEY BASKETBALL SHOW" Monday, December 3rd starting at 7:00 pm! 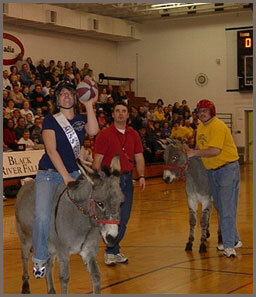 It's basketball played on real, live donkeys and it will be wilder that a rodeo and funnier than a circus! All local players will be riding, so come and see someone you know try to ride a donkey and play basketball at the same time. It's a thrill a minute, a spill a minute! Lauch as you've never laughed before at the wild and crazy Donkey Basketball show! 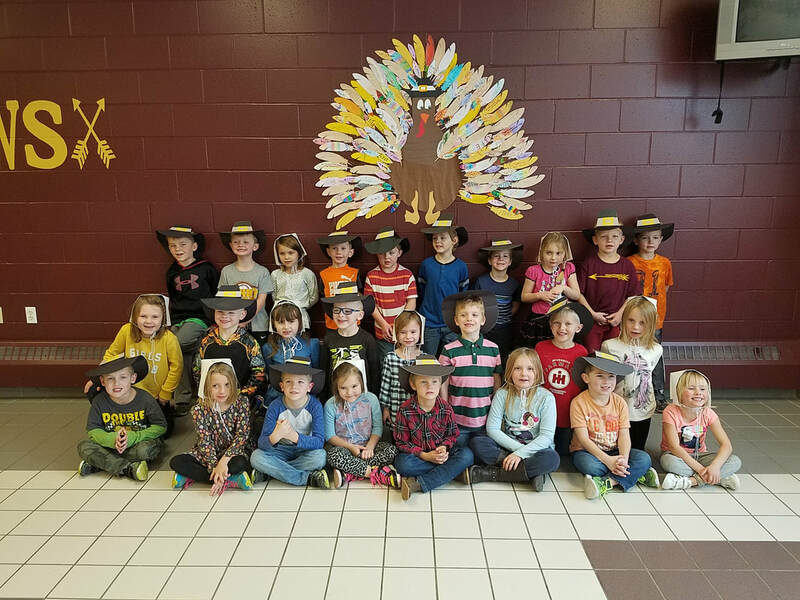 ​The kindergarten class proudly posed for a picture before their Thanksgiving feast wearing their pilgrim hats and bonnets. The students and their families enjoyed a delicious sit down meal consisting of stew, cornbread, and pumpkin pie. The class helped make the entire meal along with help from Mr. Steenblock and the 9th grade class. 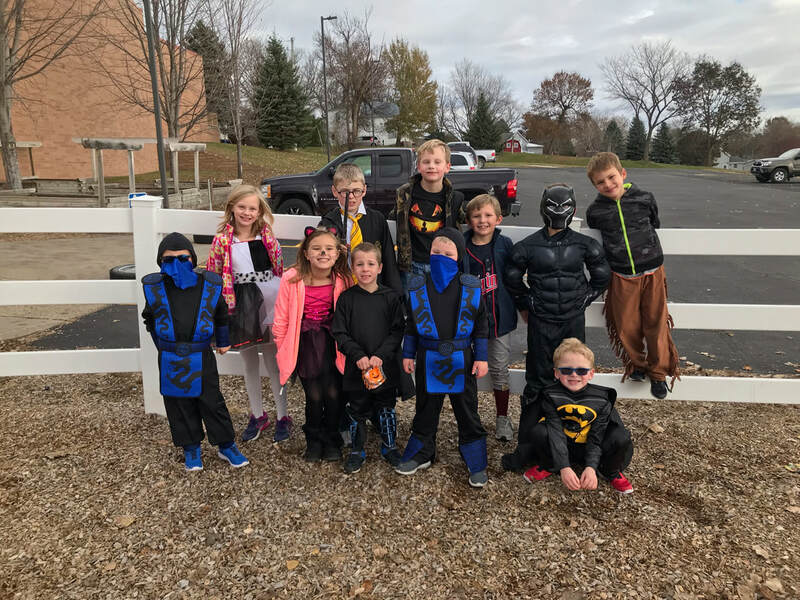 After school program kids showing off their costumes!